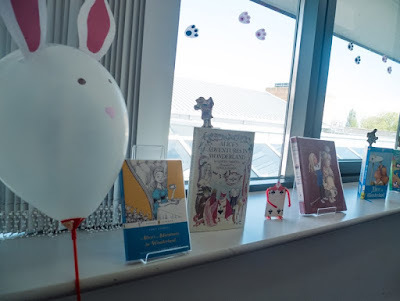 Lewis Carroll’s Alice’s Adventures in Wonderland is 150 this year, which was the perfect excuse to have a celebratory event at the library. 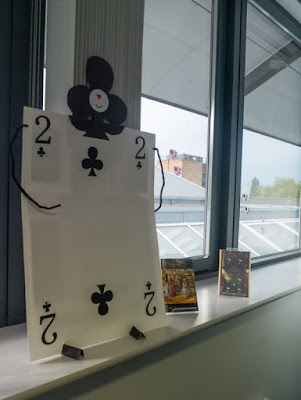 After the success of Harry Potter Book Night in February, we knew we wanted to have more fancy dress events that tied reading and fan culture — and also more events for the 8 to 12 age range, which is something we haven’t done a lot of in the past. 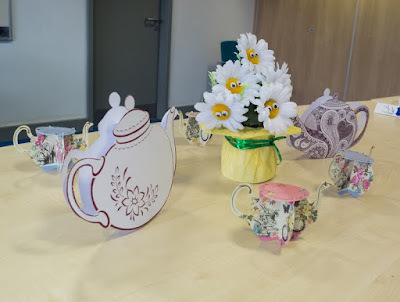 Thus the idea for a Mad Hatter’s Tea Party was born: we wanted to recreate the atmosphere of the story, dress up as characters and invite the children to do the same, have a reading from the book, do various craft activities and play some fun group games, and wrap it all up with actual afternoon (iced) tea. 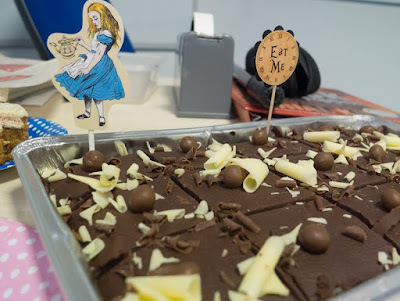 I don’t have the same sort of emotional attachment to this book as I do to Harry Potter, but all the same Alice’s Adventures in Wonderland was important to me growing up, particularly when it comes to shaping my imagination. I read the book for the first time when I was about ten, but I knew the story long before that thanks to the early 1980s anime adaptation. I had a few episodes on a VHS tape and I pretty much wore the thing out. Funnily enough, it was this and not the Disney film that became the defining Alice of my childhood. 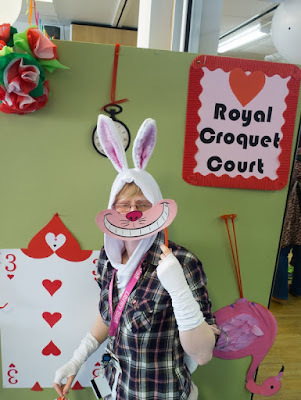 The prospect of working on an Alice in Wonderland event was exciting partly because the imagery from the book is so recognizable and fun to bring to life. We knew there were key scenes and characters many of our young attendees were likely to be familiar with, regardless of whether they’d read the book yet. Also, all these iconic images were fodder for ideas in terms of decorating the space. 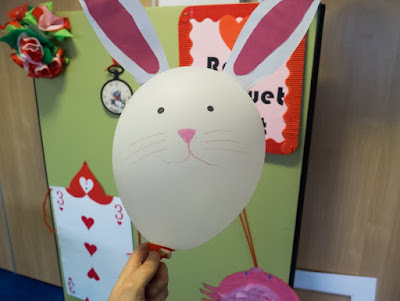 We decided early on in the planning process that this was going to happen during May half-term, and unlike Harry Potter Book Night it wasn’t going to be an out of hours event. 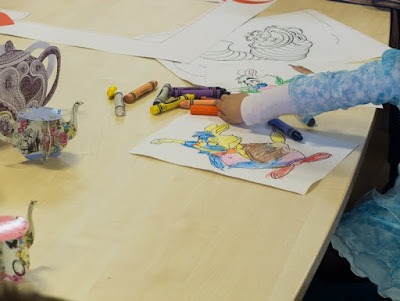 Having a ticketed event in the children’s library during half-term, when we’re nearly always packed, was going to be impossible; yet on the other hand, hosting it as a drop-in event was a recipe for disaster in terms of controlling the numbers. In the end we decided to go with the big seminar room we have upstairs. The space was large enough that we could issue 60 free tickets and still have plenty of room for people to move around and play games. However, this also meant we had to work extra hard on the decorations. 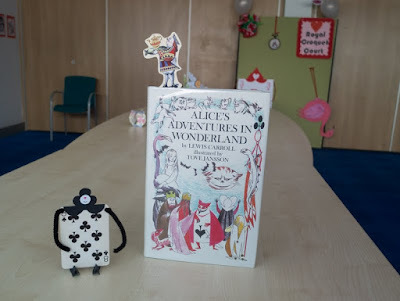 Unlike the children’s library, this room isn’t inherently interesting and full of colourful furniture, books and toys: it’s just a dull empty room we had to somehow turn into Wonderland if this was to feel like a proper special occasion. 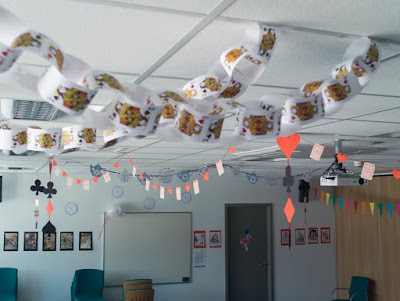 Again we had no budget, but we did have a room full of craft materials, creativity and a few months to plan. 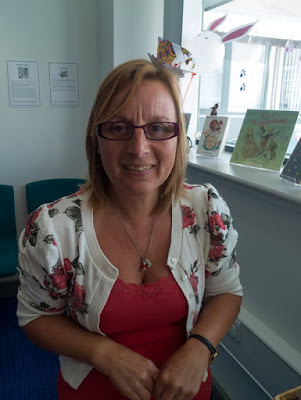 I was very pleased with the results, and more importantly than that I think everyone who came along was as well. 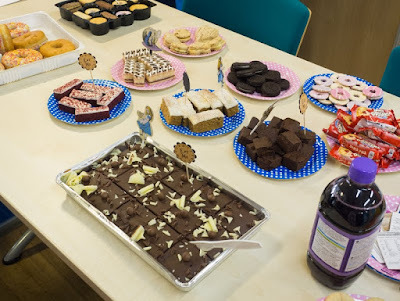 The event was a big success: it sold out weeks in advance, and although we had more ticket holders not turn up than we would have liked, we were able to make up for that with people who tried their luck on the day. Everyone had fun and we got very enthusiastic feedback and positive coverage in the local press. One thing I noticed was that the attendees skewed younger than we’d envisioned: there were a few children in the 8 to 12 age range, but I would guess that more than half were younger. 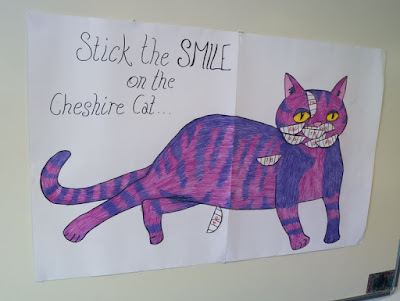 I suspect this is because we have a long history of hosting events and themed parties for children aged 4 to 7, and it’s challenging to communicate that we’re trying something a bit different while still remaining inclusive (the posters did have a suggested age range, but it doesn’t seem to have made much of a difference). 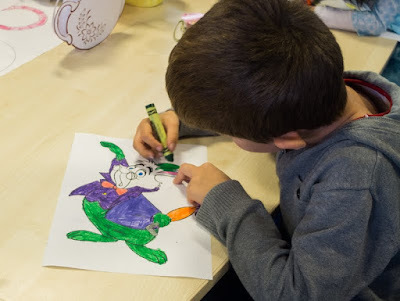 This meant that some of the more intricate craft activities, like making your own card soldier, didn’t take off in the way we’d hoped, but on the other hand we did have ever-popular colouring sheets in anticipation of younger siblings, and the smaller children seem to have had as much fun as the older ones. Lastly, I had a lot of fun working on it over the past few months. 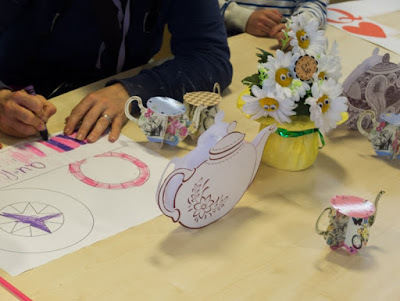 One of my favourite things about my job is that it gives me the chance to do creative projects and feel a real sense of ownership every step of the way, from the planning to the preparations to the delivery. 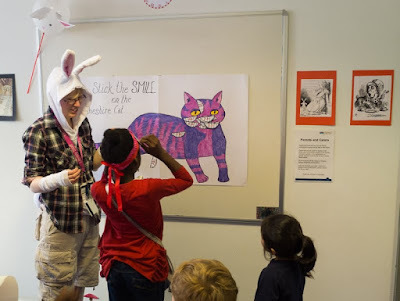 Also, I get to work with a great team of fellow book nerds and celebrate stories with large groups of children. What’s not to love? The entrance to the room. This was a photo opp area: I’m really glad we had it, both because the children enjoying posing in front of it and because it encouraged parents to take pictures with their phones, share them on their social media accounts, and tell the world how much fun they were having at the library. 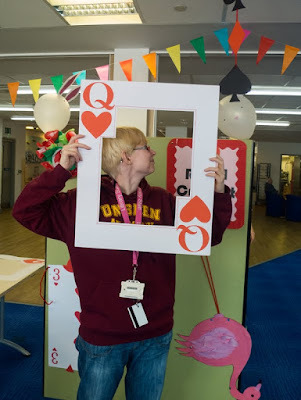 We also had giant empty card frames you could pose it. Here’s my friend exemplifying. 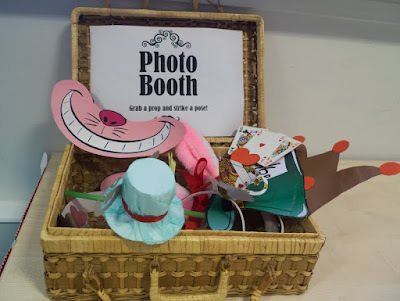 And here are some photo booth accessories to encourage further posing and picture sharing. A colleague kindly models the teacup fascinator from the box. 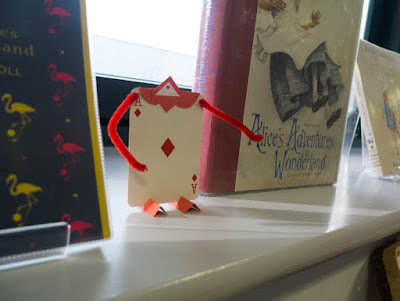 Card soldiers and books on display. One of my favourite editions of Alice, with illustrations by Tove Jansson. Another detail I’m proud of: bunny paw prints along the windows. 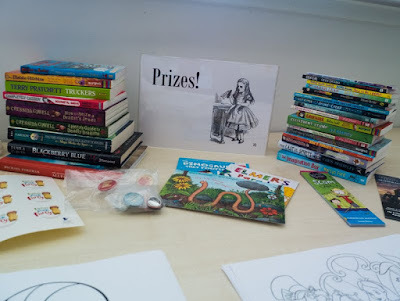 Prizes for the games and for the lucky ticket raffle we held at the end. 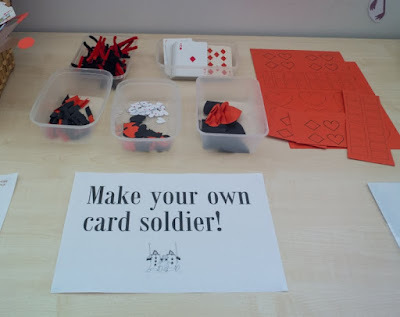 Make your own card soldier corner. 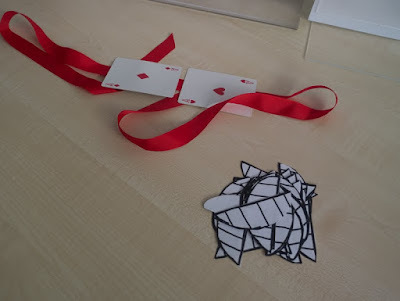 A card-themed blindfold for participants, and a pile of cat grins. 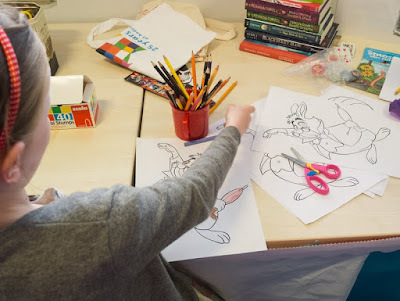 The colouring sheets proved as popular as always. 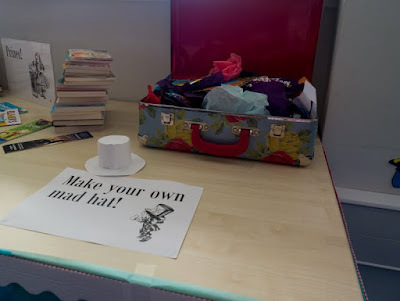 Some hat making in action. 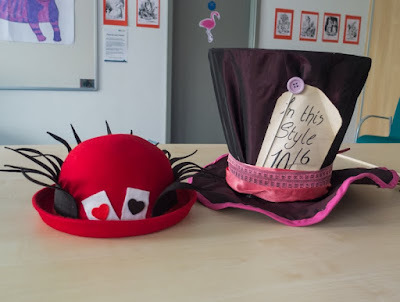 The Mad Hatter and the Queen of Heart’s hats. And here we are in our fancy dresses. 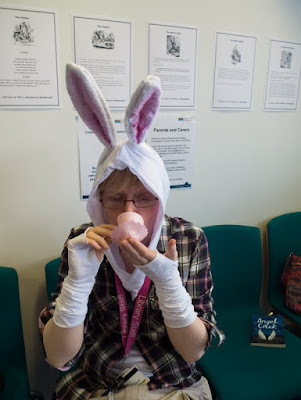 The White Rabbit enjoys a cup of tea. 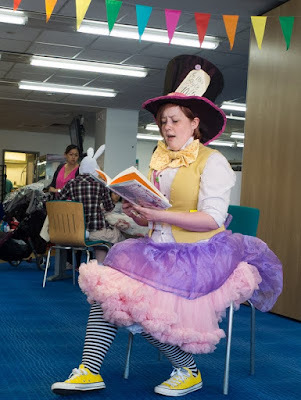 ...and the Mad Hatter reads from the book. 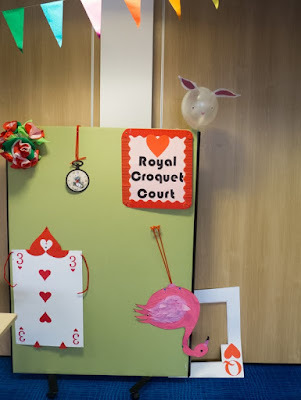 The care and creativity you put into your events is amazing! I think you have very lucky children at your library. Awww, thank you! They looked like they were having fun, which makes me really happy. This looks so wonderful! And I agree, the amount of care and creativity that comes across in these pictures! I am very happy for the children, but also very happy for you & your job givin you such opportunities. Thank you <3 The event is now a bittersweet memory in light of today. Oh. My. Goodness. This post had me smiling until my cheeks hurt! I cannot even imagine how hours of hard work went into this. But I imagine this is the kind of work, and then the kind of day, that makes the exhaustion of your job feel rather worth it, huh? 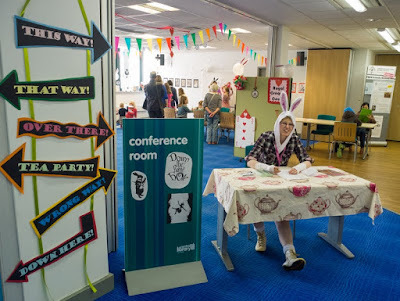 I'd have loved to have this kind of event at my library when I was a kid! Thanks for sharing the photos - looks so much fun (and hard work!!). How darling! And how I wish I could take my kids to such am event! Awww, I wish you could too! Awesome libraries for all is what I say. How fun! 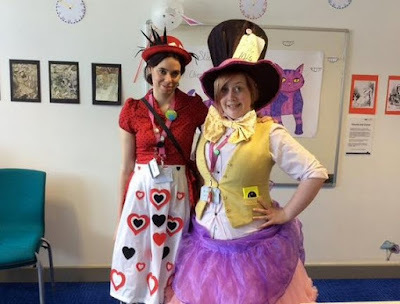 Alice in Wonderland has more of an emotional attachment for me than Harry Potter due to my age I'm guessing. This looks like a wonderful event. Thank you! And yeah, that makes sense. I do love Alice a lot, though - I read and watched it a gazillion times as a kid. I love it! How completely adorable! Great job and I still want the tights. :D They're the best tights. I would have looooooved having events like this near me too. Which is part of why I enjoy being a part of making sure other kids do have them! Everything turned out so great especially considering how much you had to make with low budget and time. I wish we could do stuff like this at our shop but we mostly had to cut kids events beyond author ones because of time and staff issues. I love this! My library never had fun events like this when I was a kid. They just focused all their energies on the summer reading program, which was far less elaborate. Thank you! 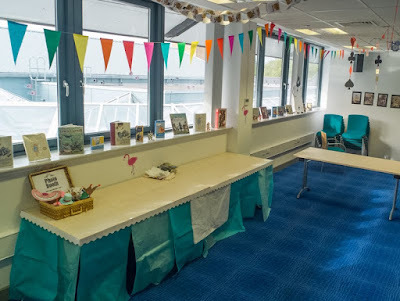 And that's sad about your library - I wonder if it was a matter of staffing/funding, as it often is :( Unfortunately I'm less than optimistic about our ability to carry on doing events as elaborate/time-consuming as this. 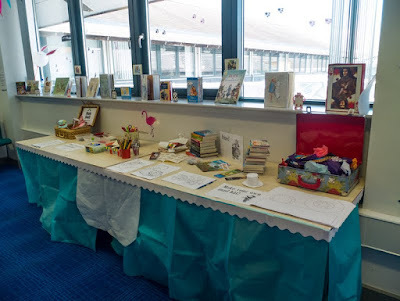 Over here summer reading programs are organised nationally by The Reading Agency, so although there's still a lot to do we at least don't have to start from scratch. Wow - the decorations are awesome in both conception and execution! 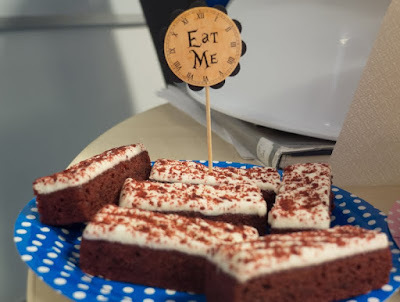 I love the card soldiers, and the hats, and the cute little "Eat Me" signs on the food. What a fun event! So glad it was a success. 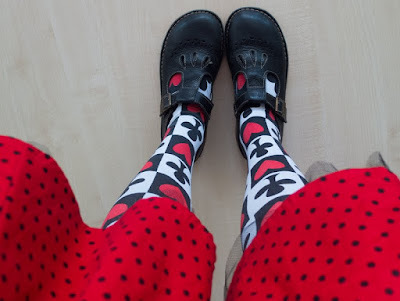 I love your tights!